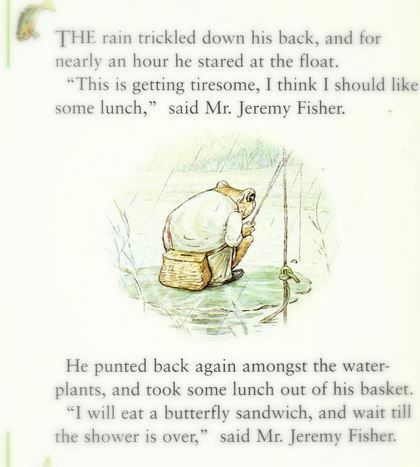 To further explore the verdant theme and make use of all the cress now growing on my kitchen windowsill, I reread The Tale of Jeremy Fisher, which is an extremely watery, green sort of story, perfect for a rainy day. 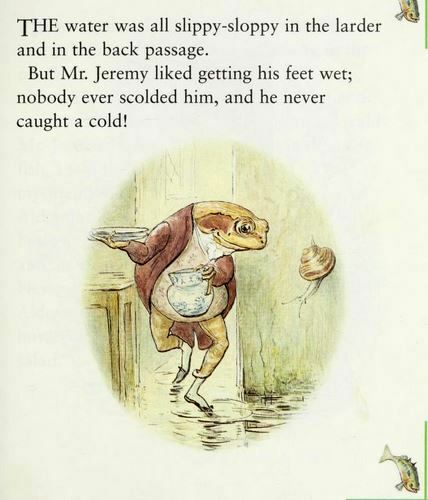 The story concerns Mr Jeremy Fisher (a frog), who lives in a “damp house amongst the buttercups at the edge of a pond.” So close to the edge, in fact, that the water gets into his larder, but Jeremy Fisher doesn’t mind that; he likes getting his feet wet. He also is pleased when he sees that it’s beginning to rain. Jeremy Fisher does indeed go fishing, but the rest of the story is a series of misadventures. He fails to catch anything for a long time, so he decides to have his lunch of a butterfly sandwich (!). 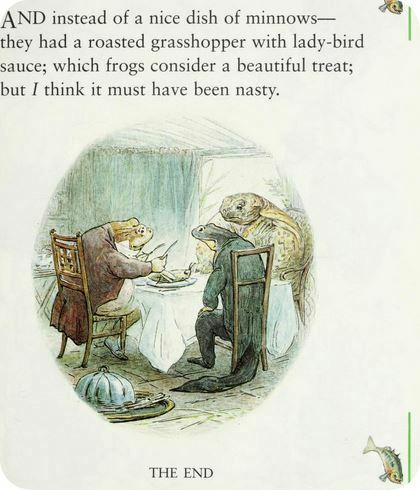 But while he is eating he is pinched by a water-beetle and hears a mysterious splash which he is afraid might be a rat. 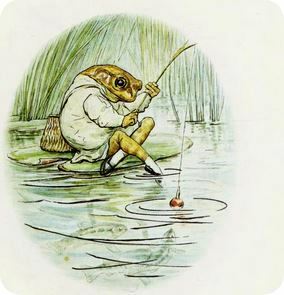 Then he catches, instead of a minnow, Jack Sharp the stickleback, who flaps around with his prickly spines, and a shoal of other little fish laugh at Mr Jeremy Fisher. Worst of all, Jeremy is then eaten by a big trout. Thankfully, the trout doesn’t like the taste of Jeremy’s a mackintosh and it spits him out. This story is fun for all ages, although it does have a little bit of peril for Mr Fisher. Though he had a bad day, he managed to persevere, adapt and make a nice dinner for his friends anyway. It would also be a good opportunity to learn about frogs and pond life. 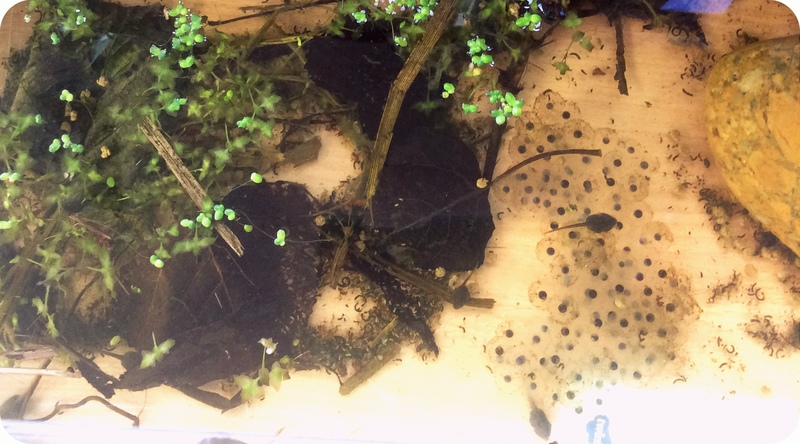 This is a good time of year to look for frogspawn. But obviously it had to be a fish dish. 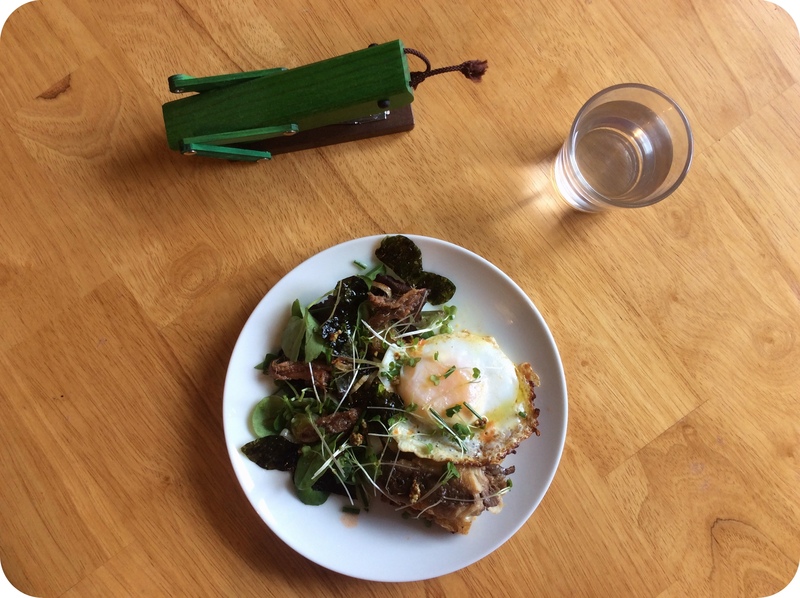 For the minnows I used sardines, and had them with a bit of toast, a duck egg and a salad of cress. 2 Tbsp young leeks, sliced. 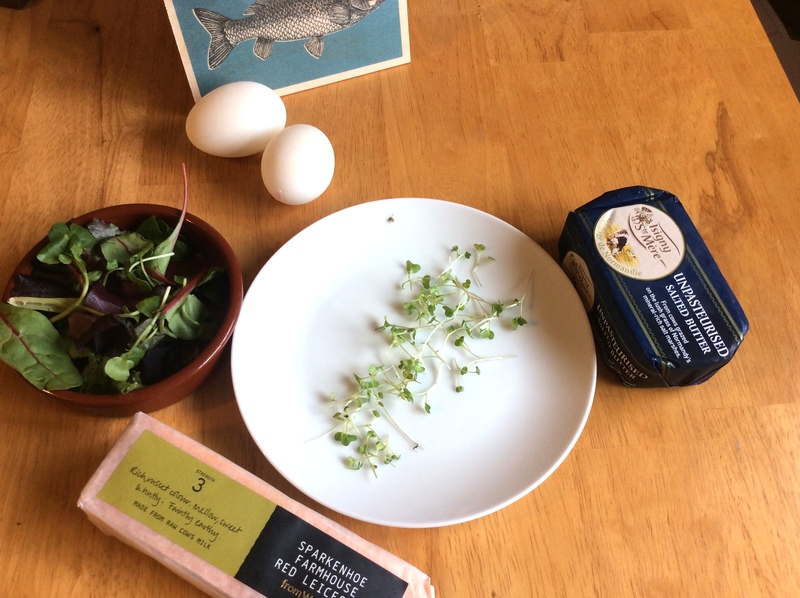 First make the salad: arrange baby spring greens on two plates, and top with cress, chives, and a couple of anchovy fillets (these are very salty so use caution!). Then cut the nori into one inch strips and sprinkle on top (these are salty too so you only need two or three). If you like you can cut them into shapes — I cut them to look like butterfly wings. Drizzle with the extra virgin olive oil. Next fry the leeks and slices of bread in the butter on medium heat, or you can also use olive oil. 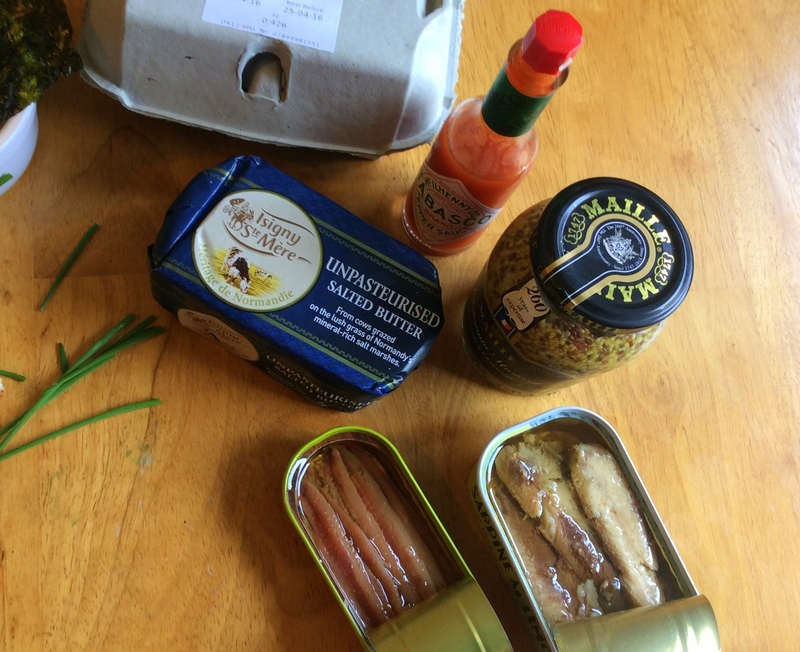 When the bread is golden, set aside and fry the sardines. Be careful with the sardines as they may fall apart if handled roughly. After a couple of minutes, when they are hot and slightly crisp, remove them and the leeks to a hot plate and fry the eggs. 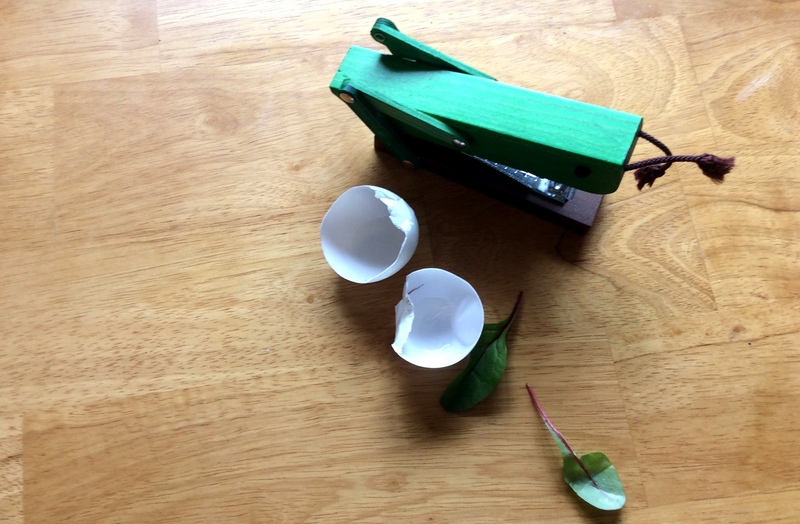 Duck eggs are preferable because they are very rich. They also should take only a minute or two to cook. 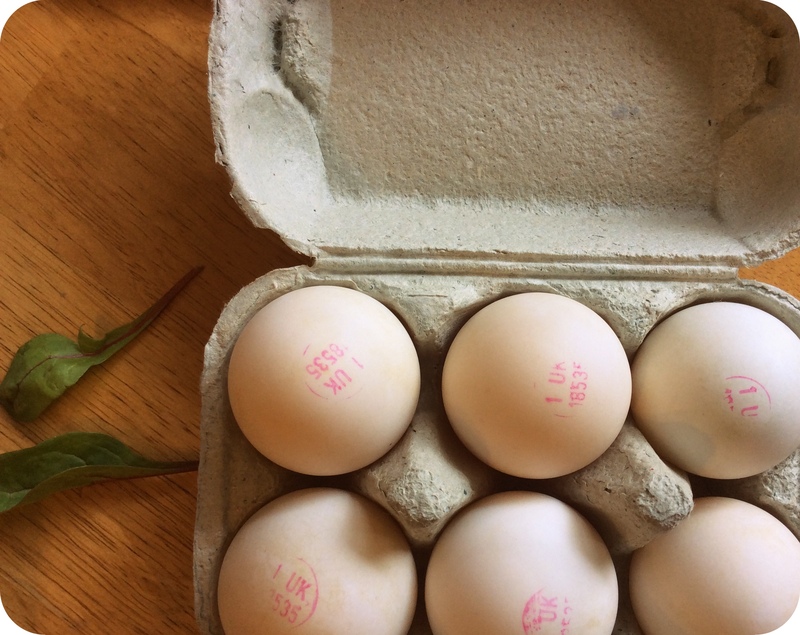 Try to keep the yolk a bit runny. Add the fried bread to the plates with the salad, and top each slice with a couple of sardines. 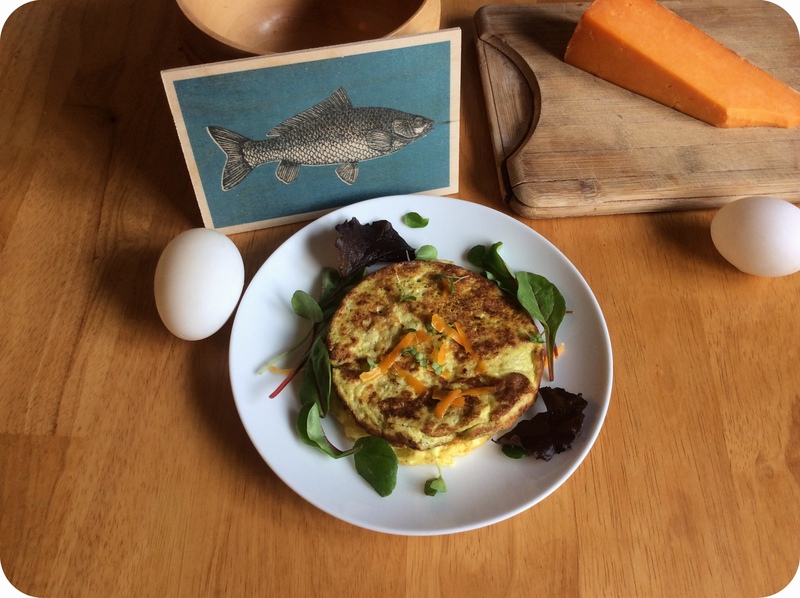 Then put an egg on top of the sardines. Sprinkle with a bit more cress and chives. At this point you can add a squeeze of lemon, although my sardines came in a tin with lemons, so I just drizzled a little of the lemony oil onto my eggs. 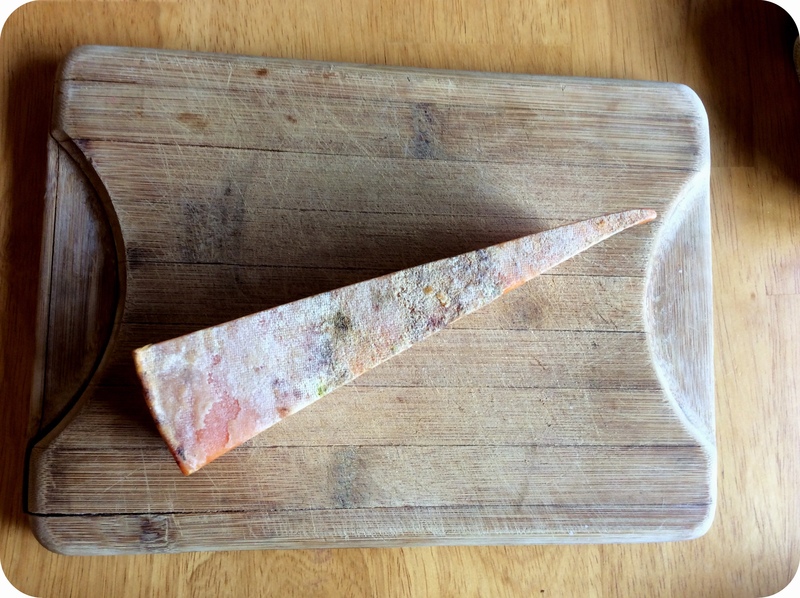 Serve immediately with hot sauce and mustard. Of course, maybe your guest is more like Ptolemy Tortoise and doesn’t want fish. 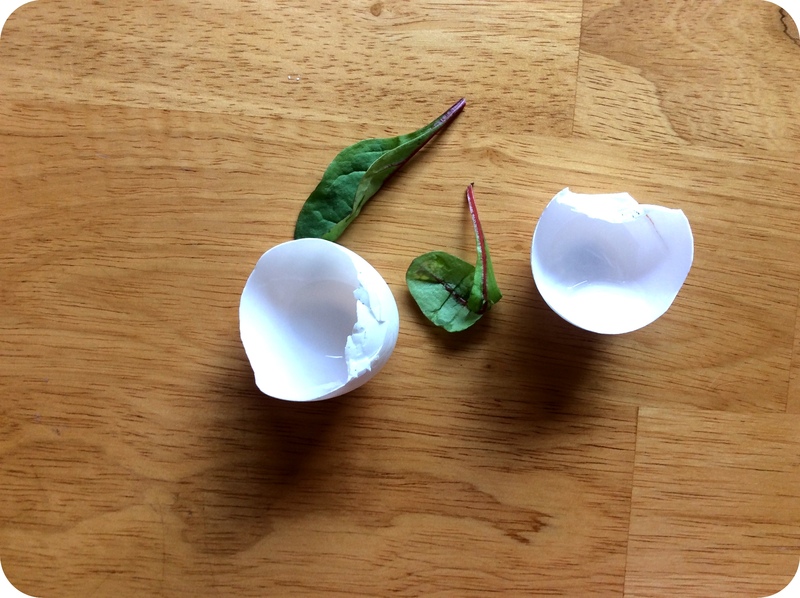 In that case, you could make this cute mini stacked omelet. 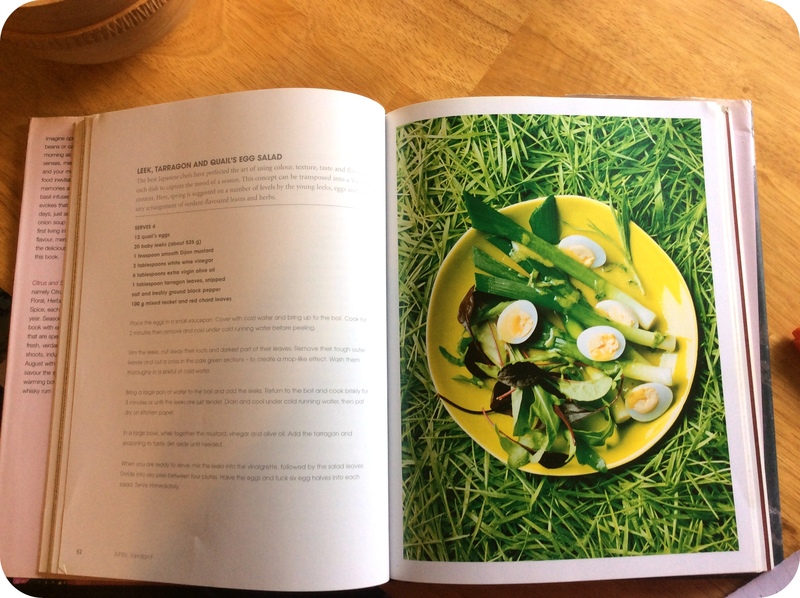 First add the spring greens with a dash of oil or butter to a medium pan to wilt. This should take less than a minute. Remove and set aside. Add the cream to the eggs, and salt and pepper to taste. Whisk them up and pour half the mixture onto a medium hot pan. If you have a mini frying pan you can use that, or you can pour the eggs into a metal cookie cutter to help them keep their shape. Flip the omelet when it starts to bubble in the middle (it should only take about a minute). After another minute, remove the omelet to a hot plate and pour the second half of the egg mixture onto the pan. 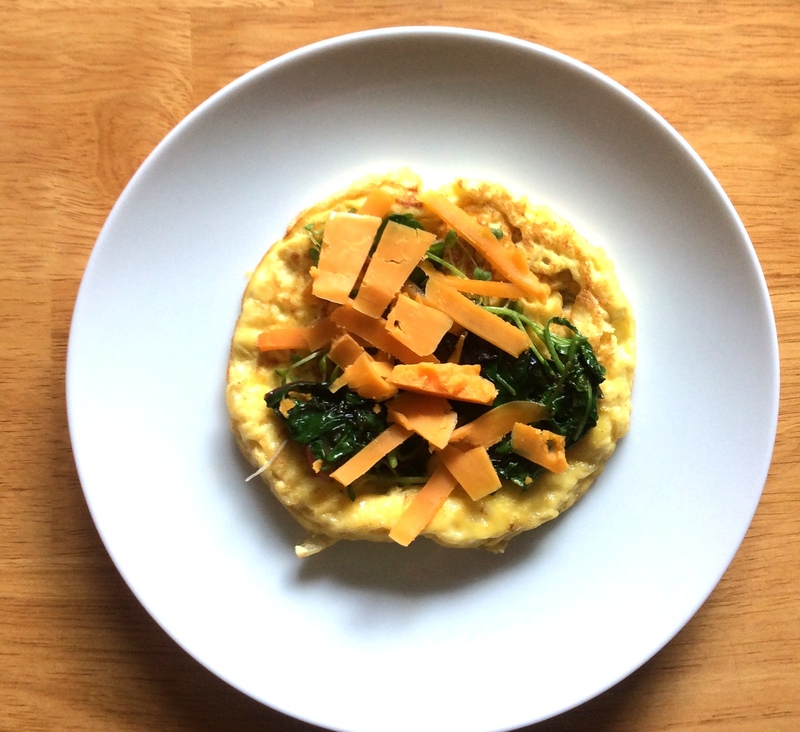 While this is cooking, top the first omelet with the wilted greens, cress, and cheese. 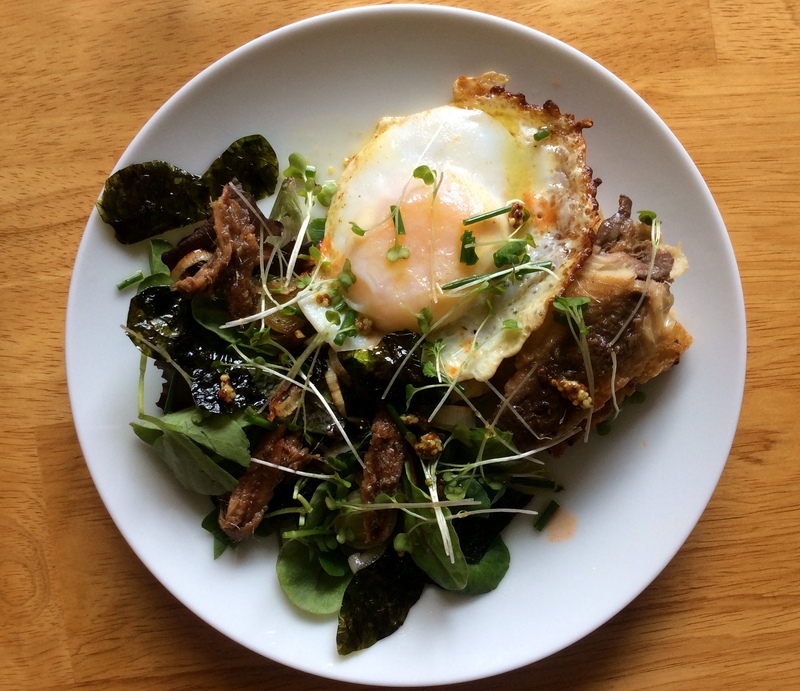 When the second omelet is cooked, place on top of the first and scatter with a bit more cress, cheese, and baby greens. Serve at once. 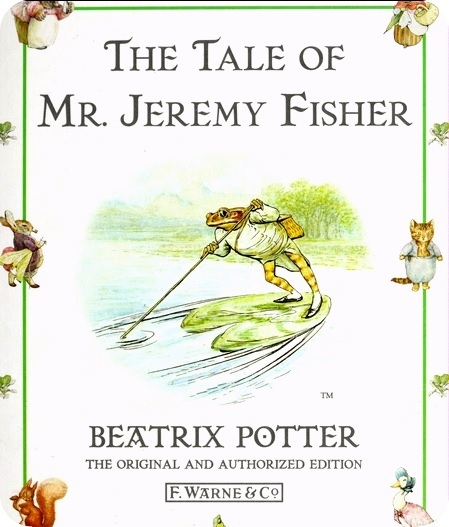 If Jeremy Fisher’s misadventures don’t put you off, never mind the rain and go fishing! 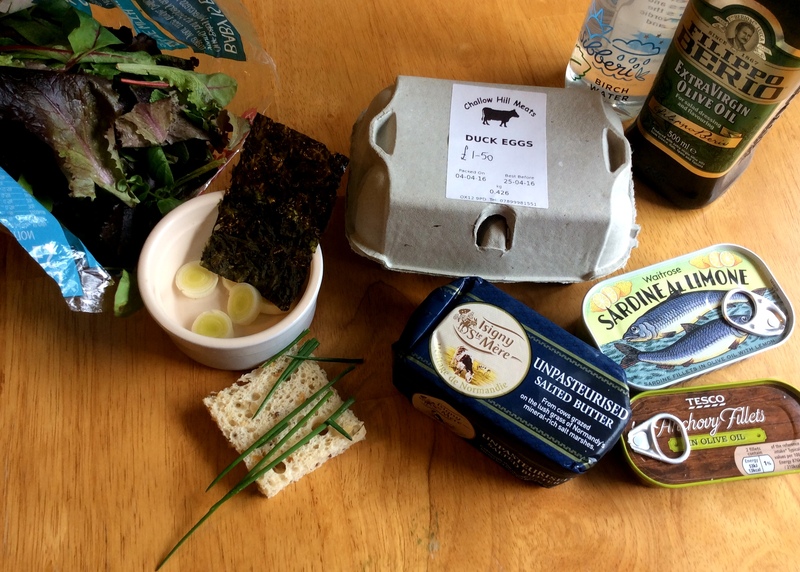 Whether you fish or not, have friends round for dinner, and cook something with a lot of green. It doesn’t have to be grasshoppers!